In response to increasingly difficult challenges as well as an unsettling number of near losses during call responses over the past year, Hero Factory researchers have been hard at work developing and testing a larger, stronger generation of heroes. One offspring of these efforts is Bergyon, a "version 1.5" hero who has undergone significant simulation testing and gradual upgrades. 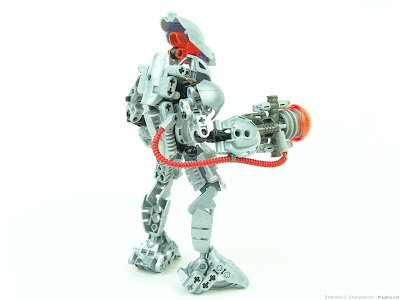 In addition to a larger size than previous heroes and numerous hardware and software upgrades, Bergeon has been paired with an experimental weapon developed specifically for his frame, the Graviton Concussion Blaster. This is a ranged weapon that charges and releases a pulse of graviton particles along concentric sinusoidial paths. In layman's terms, they spread out at first, but eventually converge back into a single space. The weapon includes a sensitive rangefinder that determines the distance to the target, and sets the graviton convergance to occur in the correct location. Bergyon himself can offset this convergance, causing it to form either in front of or behind the target. Wherever this convergence happens, the localized spike of gravitational pull affects the target in a most dramatic fashion. It's sort of like being hit by a ton of bricks, except instead of being pushed, you're pulled. Bergyon can also adjust the strength of the weapon's effect by dialing the graviton output up or down. Information gleaned from work with Bergyon is being fed into the so-called "Hero Factory 2.0" program which is scheduled to begin full production and field tests first thing next year. How do you do this? 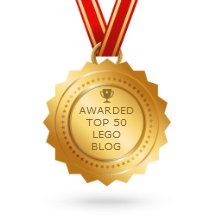 I have a ton of Bionicles, but could never design something like this! Which Bionicles did you use. I wnat want one of thoose. 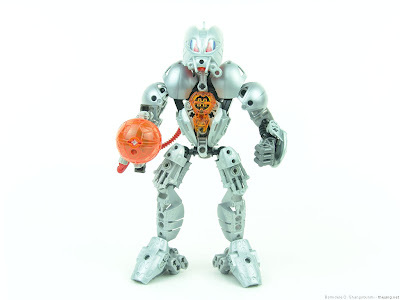 olá é muito legal esse Bionicles ,sou super fã , eu tenho uma coleção deles. Kinda looks like a Bionicle vers of Bulk.